We have had a great run the last 2 days but yesterday the S and P 500 made a twin tower effect where it formed two topping tails and that hinted of a big fall in the futures market. True enough by the morning trading session in Asian markets, the S and P 500 and Dow Futures along with the Nasdaq 100 futures all came tumbling down. The SPX and Dow Jones Futures are now back to their trading range support levels. If they do not rise and break down, this could mean further downwards for the markets. Most stocks will open in the red this morning unless the indexes can move back up a bit by morning trading session. The chart above shows the 60 min chart of S and P 500 Futures. You can see how the index formed a twin tower effect. It drop immediately after that but support kept it in check and the index drifted sideways throughout the rest of the day's trading session. This formed a somewhat triangle pattern in the smaller time frame which allowed it to form a continuation pattern for it to breakdown from. The index also formed an uptrendline which once it gap down below it, the index started to sell off for a few hours until it reached the support area below. The 15 min chart of the S and P 500 index shows a beautiful triangle that it broke down of. For short sellers this is a beautiful setup which gave traders a very nice short selling trade. Fast and big money making in a short period of time. At the time I annotated the chart, it was forming a 15 min bottoming tail. Tells traders it was time to get out of the short trade and see if there is a reversal of another continuation pattern in the next few hours. In the daily chart of SPX, things look very calm. The index is just trading sideways doing nothing much. So, as always the smaller time frame produces lots of action and short term traders can utilize it to find lots of trades. But longer term SPX is still bullish and we are looking for a decisive breakout or breakdown. Consolidation will always resolved itself by breaking out higher or lower. Usually it will breakout into the direction of the previous direction. Semiconductors have broken out of a consolidation and actually have met our measured move target. So some period of rest is expecting. 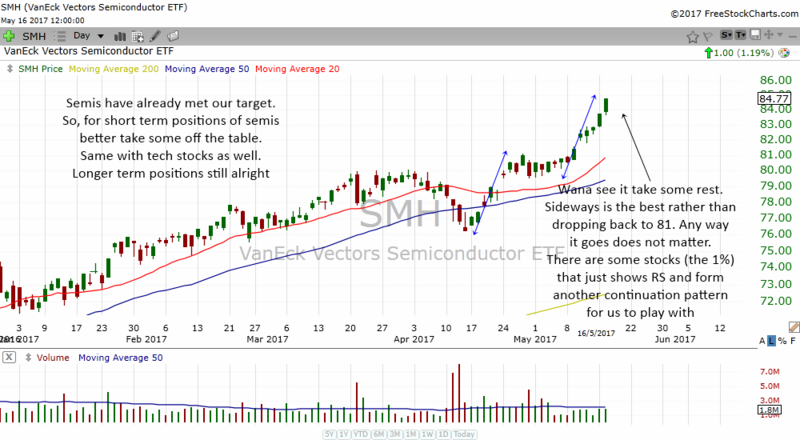 Semi stocks might even correct and therefore it is good to take some profits off the table for tech stocks for short term trades. Long term things still look fine. With ample support at $81, we are still bullish on tech stocks in mid term. There is always some index or stock or commodity that is doing really really well compared to what the S&P 500 or Dow Jones is doing. This time it is the 60 min uptrend chart of FTSE 100. Ever since the French election, this market has been going higher and higher giving traders lots of 60 min continuation patterns to play with. The saying is true "There's always a bull market somewhere". It is up to us traders to focus on them and to avoid non trending markets. The 60 min chart of Gold shows that it is bottoming, at least in the 60 min charts. It formed higher highs and higher lows and provided traders with many 60 min trading continuation setups. There might be another box setup forming and there is some resistance overhead at the previous box. Something for us to take note of.